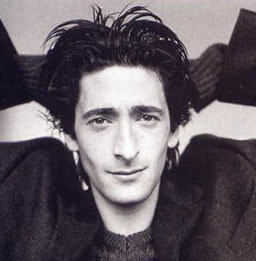 Adrien Brody's first paying job was as a magician, when he was 12. At 15, he had a role in Mary Tyler Moore's quickly-canceled 1988 sit-com, Annie McGuire, and played the lead in a PBS TV movie, Home at Last, as an orphan boy in the old west. Brody also had small roles in New York Stories, Angels in the Outfield, and King of the Hill (the 1993 Steven Soderbergh drama, not the cartoon). He played the killer in Oxygen, a punk rocker in Spike Lee's Summer of Sam, and an idiot in M. Night Shyamalan's The Village. He won the Best Actor Oscar for Roman Polanski's The Pianist (2002). At 29, Brody was the youngest man ever to receive that award. Brody was only invited to audition for The Pianist because a casting agent had seen his performance in the DVD of The Thin Red Line. It was a much meatier performance than what moviegoers saw in the theatrical release, which had been edited to almost nothing. He is probably best known for playing the screenwriter in Peter Jackson's King Kong with Naomi Watts. Brody's father is Jewish, his mother Catholic, and his family was not very religious either way. His mother is photographer Sylvia Plachy, and before he was an actor, Brody was familiar to art denizens as a frequent subject of her work.